Once a makeup artist and licensed esthetician for Chanel Cosmetics, Kim spent several years in residential management. Then she was an account executive for the Fort Worth Star-Telegram; a marketing director for MobileData Technologies followed. 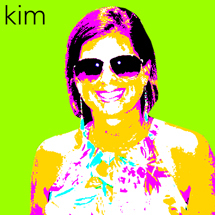 A working mom who really works, Kim deftly delivers the media responsibilities at Witherspoon. What counts for real career satisfaction? Always home and family. That’s where I feel satisfaction on a daily basis. What brings you pleasure in your job description? What brings me pleasure is a successful outcome, no matter what the job. Whether it’s as simple as a fixed computer issue or making sure the team is paid on time, to the pleasure of placing a client’s ad in a strategic location for the highest visibility and volume while being a good steward of the client’s budget. What’s at the top of your list of favorite foods? Anything someone else is cooking. What turns you on about advertising? Advertising makes the world go around. Everything is propelled by advertising, from religion to politics. What TV show would you watch over and over? “MASH.” I could watch reruns of “MASH” all day long. What hidden talent do you have? I grew up playing golf — starting when I was just a kid. Unfortunately, it’s not like riding a bike. What turns you on? A great bottle of wine, the warm sun and a white, sandy beach.